The Variable Density Flow (VDF) package is an integral part of the SEAWAT engine as it defines the relationship(s) between fluid density and solute concentration(s). The VDF package is required to run a SEAWAT model simulation. Numerous options and settings are supported as part of the translation settings in Visual MODFLOW Flex and are described below. 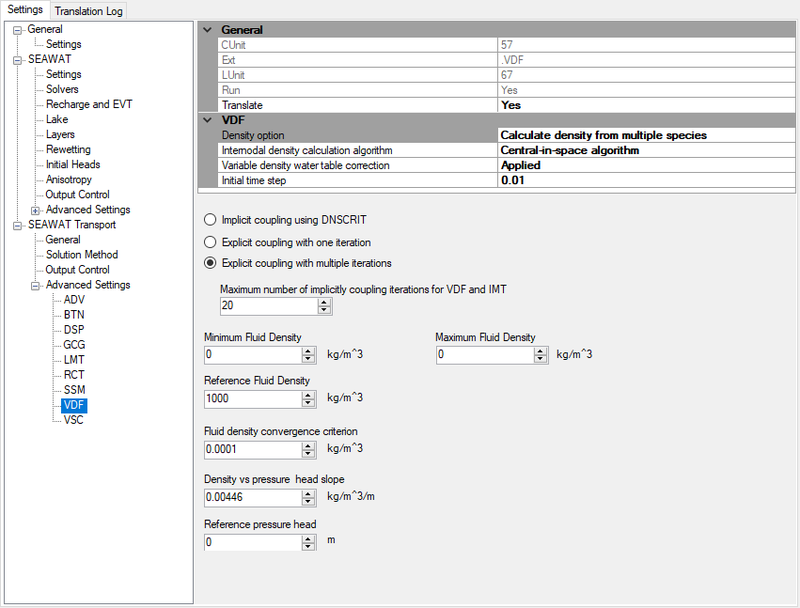 Settings for the VDF package are divided into high-level settings that are always required as part of the VDF package and low-level settings that are required (or not) based on the high-level settings. High-level settings are located in the VDF group of the advanced package table, while low-level settings are displayed as needed in the form area below. For more complete explanation of the input settings for the VDF package, please refer to p16-19 of the SEAWAT V4 Manual (Langevin et. al., 2007). This option represents a flag (IWTABLE) that is used to activate the variable-density water-table corrections (Guo and Langevin, 2002). •Explicit Coupling with one iteration - flow and transport will be explicitly coupled using a one-timestep lag. •Explicit Coupling with multiple iterations - flow and transport will be explicitly coupled using a one-timestep lag. Density will be recalculated up to is the maximum number of non-linear coupling iterations for the flow and transport solutions. SEAWAT will stop execution if the maximum number of iterations has been reached and convergence between flow and transport has not occurred. Calculated density values will be truncated if they fall below the minimum fluid density or above the maximum fluid density. If a value of zero is entered for the minimum and maximum fluid density, then SEAWAT will not truncate to a lower and an upper range of calculated density values, respectively. The reference fluid density is the density at the reference concentration, temperature, and pressure. See Theory Section above. The fluid density convergence criteria (DNSCRIT) is a user-specified density value [M/L3]. If explicit coupling with multiple iterations is selected, then DNSCRIT is the convergence criterion, in units of fluid density [M/L3], for convergence between flow and transport. If the maximum fluid density difference between two consecutive implicit coupling iterations is not less than DNSCRIT, the program will continue to iterate on the flow and transport equations, or will terminate if NSWTCPL is reached. If implicit coupling is selected, DNSCRIT is the maximum density threshold, in units of fluid density. If the fluid density change (between the present transport timestep and the last flow solution) at one or more cells is greater than DNSCRIT, then SEAWAT will update the flow field (by solving the flow equation with the updated density field). Density vs Pressure Head Slope (DRHODPRHD) is the slope of the linear equation of state that relates fluid density to the height of the pressure head (in terms of the reference density). A value of zero, which is typically used for most problems, inactivates the dependence of fluid density on pressure. See Theory Section above. Reference pressure head (PRHDREF) is the reference pressure head. This value should normally be set to zero. See Theory Section above. If choosing the latter option, you can enter or browse to .UCN file that contains the densities to be used. The .UCN file must be based on a grid of the same dimensions and have the same number of timesteps as the simulation in which it is to be used.